On June 30, 2012 the Secretaries-General of the United Nations and the League of Arab States, the Foreign Ministers of China, France, Russia, United Kingdom, United States, Turkey, Iraq (Chair of the Summit of the League of Arab States), Kuwait (Chair of the Council of Foreign Ministers of the League of Arab States) and Qatar (Chair of the Arab Follow-up Committee on Syria of the League of Arab States), and the European Union High Representative for Foreign and Security Policy met at the United Nations Office at Geneva as the Action Group for Syria, chaired by the Joint Special Envoy of the United Nations and the League of Arab States for Syria. The meeting issued a Communiqué which looked toward a political settlement based on a unified Syrian state “genuinely democratic and pluralistic,” giving space to established and newly emerging political actors to compete fairly and equally in elections. Unfortunately there are some serious flaws in the deal which, in any case, has not been implemented. The first flaw is that the deal would make the most radical Islamist organizations equal partners in any solution. This is precisely what President Obama has in mind in supporting UN decisions on Syria. Such a partnership would create not only an intolerant and dangerous Syria, but it would likewise be a severe threat to nearby countries including Iraq, Jordan and Israel. It would mean perpetual warfare far into the future. The second flaw is that “democracy” is possible in Syria. Syria today is dominated by an Alawite minority regime. The Syrian opposition is Sunni and, for the most part, is radical. The Assad-led government depends on outside forces, Sh’ia Hezbollah from Lebanon, Iranian military units and, more recently, Russian Special Forces. The on-the-ground situation is deteriorating as Assad slowly is losing his grip; the Iranians and Russians are trying to prevent the inevitable, for if Assad’s government collapses there will most certainly be a widespread slaughter of Alawites, much as Assad’s father slaughtered his opponents in Hama in 1982. Then the victims were primarily composed of the Sunni-led Moslem Brotherhood and assorted other victims: between 20,000 and 40,000 were killed. Given the vicious nature of ISIS and al-Nusra, the future revenge slaughter could be much bigger. It is clear that Putin wants to find a settlement based on a cantonal approach where the religious groups can be separated. He has proposed that Assad would remain as a titular President of Syria; but what would happen to the Syrian Army, Air force, Navy, Intelligence system and national police remains murky at best. Unfortunately for Putin, he has got no support from the United States which wants Assad out, even though the consequences of that would be chaotic and almost certainly lead to the slaughter of minorities: Alawites, Christians and Kurds. There is also a serious problem regarding a “dance partner” for any political deal, whether proposed by the United Nations or by Russia. ISIS is highly unlikely to make any deals with the Russians or the United States or, for that matter, the UN. After all, they are winning in Iraq and Syria and have their own idea of what the ISIS state should look like. Today ISIS controls over 10 million people, and the number is increasing. Beyond Syria and Iraq, ISIS is also in a very strong position in Libya and has made inroads in Nigeria. The Russians seem to recognize the danger of the current situation. They have taken steps to expand an airfield in Latakia, an Alawite stronghold, probably anticipating the likelihood that the Damascus government will soon have to be moved out of Damascus as the war is already investing suburbs of the capital and could soon trigger a mass exodus from the city. But the Russian effort is, in and of itself, not much, even when it is augmented by Iranian front line troops. The Syrian Army does not have either the right kind of army or the right kind of air force to stop ISIS and its affiliates. They have learned to move their forces deeply into urban areas where the Syrians are capable of causing mass casualties but incapable of defeating the insurgents or capturing the neighborhoods where the revolt is ongoing. Neither the Russians nor the Iranians can do much more; in fact, they have serious logistical problems supporting any military effort, and if caught by ISIL there will be public executions of their soldiers that will cause panic in Russia, perhaps even Iran. This leaves Putin and his Iranian friends on the horns of a big dilemma. The risk of pulling back into a redoubt such as the Alawite coastal areas achieves de facto what Putin would like to work out by an international deal; but it comes with certain risks. As ISIL grows stronger it is “inheriting” a vast supply of modern armaments including tanks and APCs. Eventually ISIL will train its men to use these weapons and, with the Alawite territory highly contracted, they will be sitting ducks against an ISIL assault. Thus without a legal (de jure) settlement, the Alawite canton has a shaky prospect at best. A real mystery in all this is the US position. Because of the Obama administration’s misplaced support for the UN “solution” US policy is confused and dangerous for its allies in the Middle East, even those who have the false belief that some kind of “moderate” Sunni leadership is possible for Syria and Iraq. The truth is no such moderate Sunni leadership is a player in the game, and the Saudis and their friends are foolish if they believe this is the case. More likely they think they can befriend an ISIS state and use their support as a tradeoff to avoid ISIS starting trouble inside their home borders. Is this what is behind Obama’s policy, secret support for ISIS? It could well be the case that the United States expects ISIS to win in Iraq and Syria and, like the Saudis, think some deal can be cooked with the Islamic extremists. Indeed, either the US position is simply stupid, or it is based on a calculation that ISIS will win and we might as well make the best of it. Indeed, there is some ancillary evidence that this is exactly what the Obama administration thinks. In Libya despite the rise of ISIS the US has done almost nothing to help the non-ISIS Libyans. In Iraq and Syria, the US Air Force has not attacked any ISIS training camps, and confined itself to trying to knock off ISIS leaders and, occasionally, support the Iraqi government and the Kurds when they were at risk, and even then reluctantly and with “small” air power. The problem for the Obama administration is that ISIS is consistently embarrassing by their violation of the laws of war, handling of prisoners, mass executions and other violent acts against minorities, women, homosexuals and apostates that makes it hard for the administration to find a basis for any dialogue with ISIS. But behavioral evidence is no barrier to the State Department, which has ceased to be rational a long time ago and no longer upholds US interests or supports a stable Middle East. It is no longer feasible to think that there can be a single Syrian state. But that does not mean that one needs to accept and make legitimate an ISIS state, which is where Obama is headed (even if he does not know it, which I think is not the case). Syria has been subdivided before. 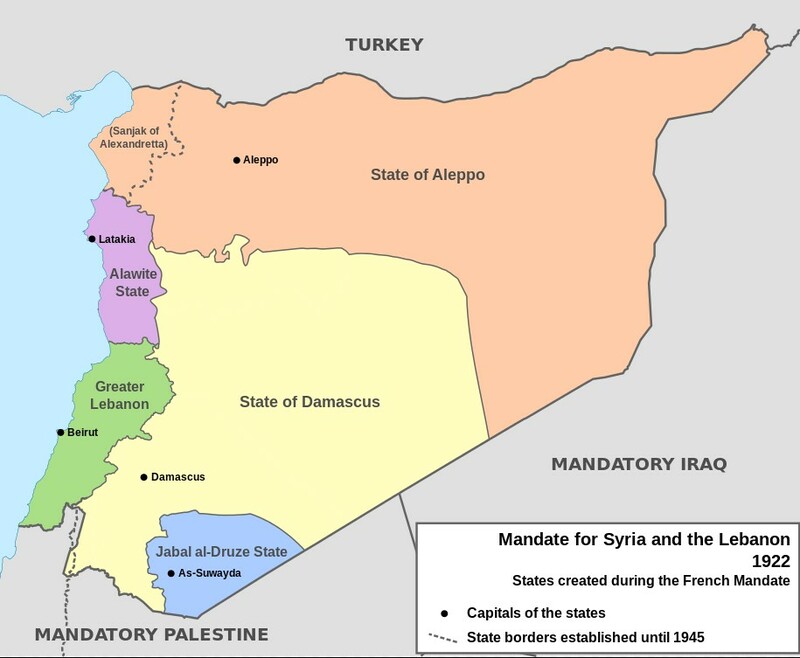 When it was under a French League of Nation’s Mandate in 1922 it was divided into different entities that included an Alawite State, a State of Damascus, a Druze state and a State of Aleppo. Today such a scheme in a revised form makes sense provided that governments can only be recognized when they protect minorities and do not violate human rights. If the United States wants to play a positive role it must work out a deal with Russia and it must drop its secret support of ISIS. It’s enough to give anyone a terminal, or certainly interminable, headache.